Fifty years ago, Dr. King called for a “revolution of values,” inviting people who were divided to stand together for social and economic justice. 50 years later, the African-American Committee stands for these same values and will march with members and community leaders in honor of knowledge, dignity and change! Are you in? We welcome everyone and encourage you to invite someone from another race, religion or cultural background to walk with us. Lert’s continue to make history with our annual tradition! March with the African-American Committee in the 34th Annual Kingdom Day Parade to commemorate the legacy of Dr. Martin Luther King Jr. in Downtown Los Angeles. Please RSVP to mwhite@seiu1000.org for location details, or call the MRC at (866) 471-7348. 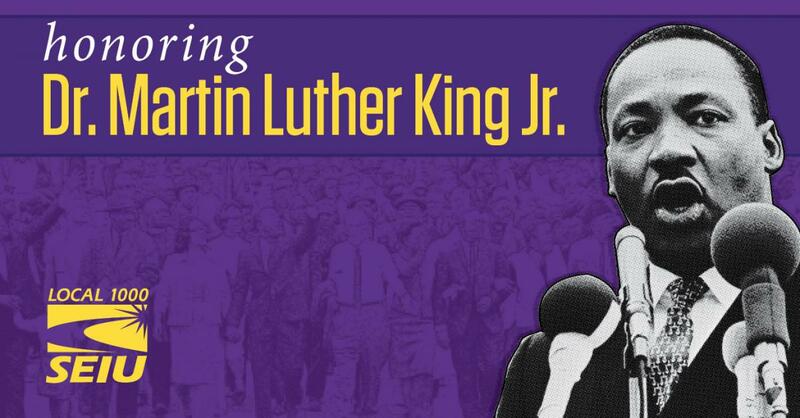 Purple up and join SEIU 1000’s African-American Committee to honor Martin Luther King Jr. This will be a two-part march with the details below. Feel free to join us at either starting point and please stay to experience the Local 1000 booth at the Diversity Expo in the Convention Center. If you need more information contact the Member Resource Center at (866) 471.7348 (SEIU). Diversity Expo 10:00 a.m. – 2:00 p.m.